Original cover artist unknown (possibly Norman Saunders); Ziff-Davis, 1951. Sam Henderson's website is here. I'll bet the original cover spent a lot of time in America's youthful bathrooms. Ziff-Davis was a pulp and paperback company too so they may have recycled. Very fun version of a very interesting cover! 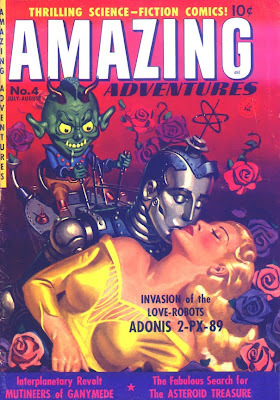 Someone should start a pulp-magazine covered blog!